I am sure you got the e-mail from Tony today, but for those that did not here are his tension tips from the APQS blog. It seems like it is a reoccurring question, so this might make it easier for all of us to find when we are having issues. Most tension issues appear as "railroad tracks" on the quilt back. 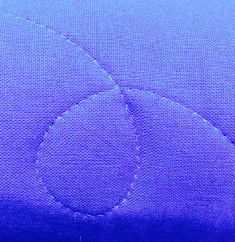 In this instance, the bobbin thread lays flat on the quilt back, and the top thread "loops" around it instead of pulling the bobbin thread into the quilt layers. If you see railroad tracks as your machine moves in all directions, start by tightening your top tension. Go ahead - turn that tension knob a good half-turn or more to the right on a longarm quilting machine! You need to make BIG adjustments on a longarm tensioner to see small impacts on the thread. If you still have railroad tracks, tighten the top tension even more. If you reach a point where the top thread breaks, you’ve gone too far. Then it’s time to take away some of the bobbin tension power so that you have more room for top thread adjustment. It is OKAY and many times necessaryto adjust bobbin case tension. Toss away your fears, be brave and give yourself permission to change it. Bobbin tension gauges and "drop tests” are great ways to find a starting point for tension but the trick is to use them as a guide, not an absolute. If you can’t get the results you need by tightening the top tension, then loosen the bobbin tension - even if it means defying some arbitrary number on a tension gauge chart or in a drop test that measures how many inches the bobbin case should slide down if you pick it up by the thread tail. Unlike the top tensioner on a longarm, you’ll only need to make small adjustments to the bobbin case. Turn the larger screw on the outside of the bobbin case counterclockwise only about "5 minutes” if you imagine that the slot on the screw points to the numbers on a clock. Sometimes your tension will still be unbalanced even though you’ve done your best to balance the tug of war between the top and bobbin tension. If you notice tension changes when you push the machine away from you or to your right when standing at the needle but looks okay when you move in the other two directions, then your quilt is suffering from directional tension issues. 1. Needle Size. Thick threads, coarse threads like cotton, or strong threads pull on the needle harder. Choose a larger needle if using these products. 2. Quilting Motion Speed. Even if you use a stitch regulator, you can move the machine very quickly. That increases needle flex and adversely affects tension. Slow down your quilting motion for better tension. 3. Stitch Length. 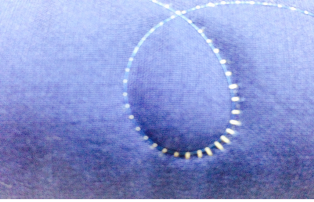 If your stitches are far apart, the needle bends farther between stitches. Shorten your stitch length to reduce flexing. 4. Quilt Tautness. Just because you CAN make the quilt tight in a frame doesn’t mean you SHOULD. Keep the quilt snug—but only enough to avoid puckers on the back. Overly tight quilts on the frame increase needle flex and also flatten out the air space in the batting where the threads are supposed to meet. 5. Thread Composition. Cotton thread pulls on a needle harder than polyester, especially if it’s also trying to pull through cotton batting. Try switching to a smoother polyester thread for better tension in all quilting directions. 6. Batting. Thin batting doesn’t provide much room for locking stitches. Also, dense batting makes it hard for the needle to penetrate the quilt layers. For best tension, choose batting with a little loft, and one that is not densely formulated. 7. Fabric Type and Thread Count. Each fabric type introduces variables that affect tension. Fabric that has a high thread count such as batik will make the needle flex more with each stitch. Plus it’s harder for the needle to penetrate densely woven fabric. Choose a smaller needle and smooth thread like polyester to reduce the friction caused by the high fabric thread count. Each quilt possesses unique characteristics that will make it slightly different from the previous quilt. It could be something as simple as the humidity in the air that changes from one day to the next that will affect your tension. Remember that if you can’t tackle the tension by adjusting your top and/or bobbin tension, it’s time to start looking at the other variables to see if you can make a change. Relax…and if you're frustrated, walk away for a little while and come back with fresh eyes. Use logic and common sense to work through your tension troubles. One student recently told me that there must be a "secret handshake" that she wasn't taught because she was struggling so much with tension. After learning about the other factors that can affect it beyond just adjusting the top or bobbin tension, and much impact any needle flex has on tension, she felt like she was finally a "member of the longarm quilting club." Well, you don’t need a longarm to learn any "secret handshake” when it comes to tension. These tricks will help you become a tension master in no time. But if you ever encounter a tension issue you can't resolve, just call us...that's what customer service is all about at APQS! When you're hard at work on a quilt, and your thread decides not to cooperate, your blood pressure can increase exponentially. Most thread breakage issues have easy solutions. When thread breaks, it is either at its "stress point" or something is snagging it, causing it to break. The trick to finding the rightanswer is to use a step-by-step process to eliminate the obvious suspects instead of trying a shotgun approach. We assume you have chosen a quality thread to begin with, since inconsistencies in quality and strength lead to problems all around. Step 1: Try a different cone of thread. Even with the most expensive, high quality thread, you can have a bad spool or even a small section on a spool. If you use the same type of thread for your replacement spool as your spool that is breaking, then your first cone has a bad section. Pull off several yards and try again, or get a different spool. However, if your thread continues to break, try a thread that you have had good success with in the past. 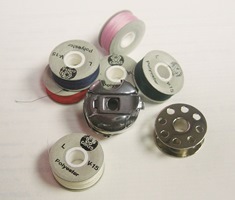 If it sews well, then the solution lies in the thread path, tension, or thread quality. But if it continues to break as well, move on to these additional steps. Step 2: Re-thread the machine. Don't get lazy here and just trust your eyes. Take the time to go back to the thread cone, and start completely over. Be sure to "floss" the thread down into the tension disks. Step 3: Insert a new needle. The eye of a needle can be very sharp, which can shred and cut thread. Step 4: Loosen the top and bobbin thread tension a LOT. Loosen the top tension until the tension disks are almost flopping, and loosen the bobbin case tension until the bobbin case zings to the floor. See if you can remove most of the tension and simply get the machine to sew, no matter how ugly the stitches are. This step will help eliminate tension settings as the reason for the breakage. If the thread does not break with this loose setting, then begin by tightening the top tension knob again, one-half turn at a time as you do some test sewing to check your stitch quality. Adjust the bobbin tension as well to fine-tune your stitches. Many times thread breaks simply because the tension settings are too tight for the thread. Starting from the "loose side of things" and tightening the tension produces better results than to try and work backwards from a "too tight" setting. Step 5: Change the thread path. Thread coming off the cone in a clockwise direction should follow the normal threading procedure in most cases, with the thread wrapping through the 3-hole guide near the tension disks in a counter-clockwise direction (back to front). However, if the thread exits the cone counter-clockwise, try turning the cone over to reverse its feed. Other threads perform better with a straighter line through the thread path (King Tut, metallic threads, holographic threads are examples). 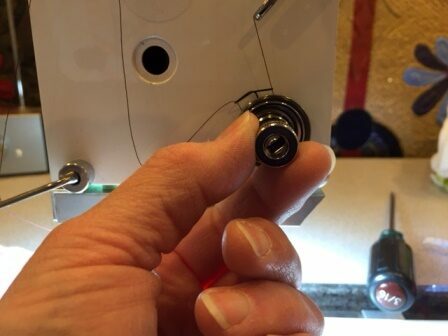 Instead of wrapping the thread around the 3-hole guide, try weaving it through the guide instead--up into the rear hole, down in the middle hole, up through the third hole and on toward the tension disks. This removes some of the twisting action that can break thread. Step 6: Examine the thread path for burrs. Threads like invisible thread, metallic thread, and heavy polyester thread will create wear grooves in the thread guides. Keep spare guides on hand and replace them if necessary. As a temporary fix, loosen the screw holding the guide in place, and rotate the guide 180 degrees so the thread rubs on a different part of the guide. Your top thread rubs on all sides of the needle hole in the needle plate. If you've scarred the plate with a scratch from a needle, your top thread will break. Smooth out the rough spot with the emery cloth, taking care not to polish it so much that you enlarge the hole. The hook assembly has several locations where the needle could strike it and cause burrs. Check your machine manual appendix section for an appendix titled "Hook Maintenance" for important tips on caring for your hook assembly and retaining finger. Step 7: We're here to help. Call Us! If this short list of self-help strategies does not do the trick, by all means call us. Take advantage of the lifetime customer support you receive from APQS, whether you're a new owner or have been at it for 20 years. Together we'll get you back to quilting! The poor bobbin has earned an undeserved reputation as mysterious and misunderstood. Countless sewing machine instructors have instilled fear into the hearts of new sewers, advising them to never touch the bobbin tension. What, pray tell, would happen if you actually did? Well, for one thing, you might discover the key to balancing your tension and having beautiful stitches! We hereby grant you permission to change the bobbin tension and promise that the quilt police will not arrive with handcuffs to arrest you. You can use a Towa gauge to help you determine tension, but it will only serve as a guide. Each quilt will present different circumstances which can require adjustment, including the batting composition and thickness, fabric condition, thread type, machine speed, stitch length and your personal motion. Needle flex is the biggest single factor affecting balanced tension. The more it flexes, the harder it will be to keep consistent stitch quality. When the top and bobbin tension are tight, the thread pulls hard on the needle and increases the flexing motion. You can run the machine with looser top and bobbin tension and still have beautiful stitches, since the looser tension will allow the top thread the opportunity to do its job and pull up the bobbin thread. It's ok if your bobbin case drops to the floor when you lift the thread tail if it gives you good tension! Spend time evaluating your bobbin case. Clean out any lint or thread from underneath the tension finger along the outside of the bobbin case. Remove the bobbin brake spring occasionally and clean the interior portion of the case.When your bobbin rests in the case on top of the brake spring,the bobbin should protrude slightly above the rim of the case. This tells you that the brake springs "fingers" are applying pressure to the bobbin when it's inserted into the hook assembly, and that the brake spring will stop the bobbin from spinning when you change directions. Editor’s note: Today’s post about tension comes from our friends Susan Rubino and Chris Wenz over at Over the Top Quilting Studio in Austin, Texas. The two are longtime Austin-area APQS representatives and longarm quilters. Thanks for the article, guys! In quilting there is only one word that is equal to a four letter word except it has 7 letters … TENSION! Yes, tension is the one problem that all quilters will encounter at some time in their quilting career. However, with careful and methodical adjustments you can have perfect balance. When you begin the process of quilting you want to be sure that the machine is clean and free of dust or lint, which can wreak havoc and exacerbate your tension issues. Even a tiny piece of lint can intermittently upset your balance. Remove your bobbin brake spring from inside the case and clean underneath it. 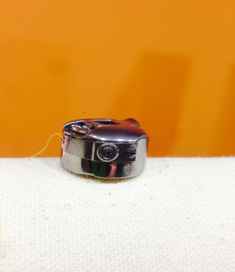 Replace it so that the "fingers” on the brake spring face out of your bobbin case. They put pressure on the bobbin and stop it from overspinning when you change directions. Remember – one insidiously hard place to find lint is under the tension spring in your bobbin case. Be sure to use a business card to get under there, never a pin! The number one way to be sure that you have your bobbin tension set correctly is to use the "drop test.” This is a surefire method to determine if your tension is set just right. Here’s what you do: Hold the bobbin case with a filled bobbin in one hand and hold the thread tail in the other. Lower your hand with the bobbin case and allow the bobbin to free float. It should fall about 4 inches if you give the thread tail a slight jerk. This is a good place to start, but you can adjust the drop more or less depending on your thread type and bobbin type. If the bobbin case releases too quickly you will want to tighten the screw ever so slightly. 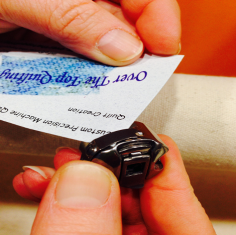 We use our thumb fingernail but you can also use a tiny flat-blade screwdriver. If you find when you give the bobbin a quick jerk and it doesn’t move at all, you need to loosen the screw. When we get that bobbin set properly, we tend to just leave it as it is, never coming back to it if there are further tension issues. So now that you have your bobbin set it is time to check the top tensioner. On the APQS family of machines there is only one tension disk and thank goodness for that! The ease of only checking one place for tension truly helps alleviate your personal tension level. Be sure that your thread is going through the thread path correctly. Tension problems oftentimes are misdiagnosed when in fact it is an improper thread path! The photo above shows the back of a quilt and is an example of top thread tension which is too loose. You can see that the top white thread is creating "railroad tracks” on the backside of the quilt. An easy way to tell if there are railroad tracks on the bottom side of the quilt is to run your fingernail along the bottom stitching and you will be able to both feel and hear your nails rapping against the threads. The top thread needs to be drawn up into the quilt sandwich to make a pretty stitch on both sides. One other way to handle tension issues is to avoid them. We tend to use pre-wound bobbins almost exclusively. That way we know that when we insert a new bobbin, no adjustments need be made in the bobbin area. Of course, changes in the weight of the top thread will likely require some tweaking. To do that, you need to be at ease with making modifications to your top tensioner. We recommend to our clients that they think of the tensioner knob as if it were the face of a clock. If changes need to be made, we tell them to assertively turn the knob a full 30 "minutes” either to the right or the left in order to make an appreciable change in the tension pressure. Remember, righty-tighty, left-loosy! The best way to keep track of your changes is to make a small mark on the tension knob as a reference point. TENSION! A perfect word to describe one of the headaches of quilting. With these tips you now have a few ways to no longer let it get the better of you. You too can achieve perfect balance in your quilting life! Susan Rubino and Chris Wenz own Over the Top Quilting Studio in Austin, Texas. The two are longtime Austin-area APQS representatives and longarm quilters. Thanks for the article, guys!